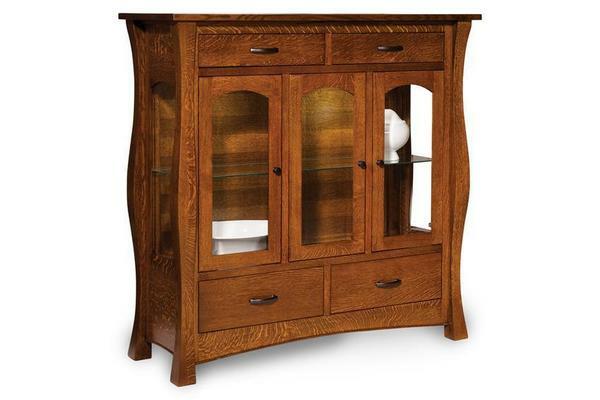 The curved lines and beautiful wood grain pattern add to the elegant beauty of this Amish York High Buffet. Built in the wood shops of skilled Amish wood workers right here in the United States. These craftsmen are committed to producing the best quality and most durable furniture available. Choose from three different widths to have your buffet match your size preferences. Size options include the 2 door 45" width, the 3 door 57" width, or the 4 door 69" width. Decide which one will fit right with the size of your dining room and have it custom made to your liking. Also choose to have a backsplash, hardware type, wood type, and finish type. You will be very happy with this American made piece of Amish carpentry. If you have any questions about this handcrafted solid wood buffet, call one of our friendly Amish furniture specialists today! Width: 45", 57" or 69"